Romantic comedy Queen Katherine Heigl recently stepped out in what can only be described as her best of show western wear. Where on earth is she off to? A rodeo? Billy Ray's birthday party? Try none of the above. The ultra talented actress was actually heading to a business meeting in the most glamourous spot in LA, Beverly Hills. The former Grey's Anatomy favorite wore a leather fringe skirt, brown suede slouchy boots, paired with a white button up and a leopard print bag. 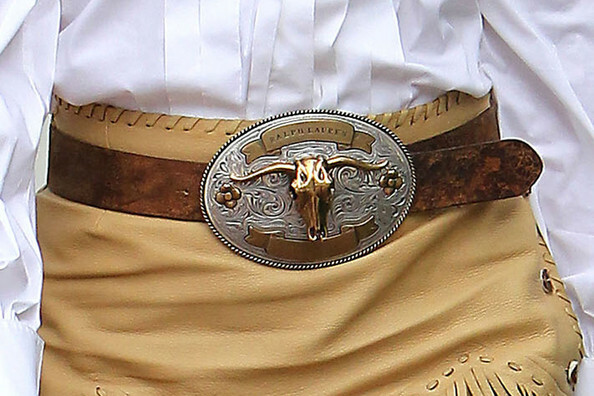 Oh and let's not forget to mention her Ralph Lauren belt buckle. I wasn’t a fan of this look when it hit the runway for Spring/Summer 2011 and unfortunately I’m not a fan of it here. As much as I hate to say it, Katherine’s strange and random western look lands her as my fash fail this week. Its not just the theme that bothering me but the pairing of the different fabrics. I know she can do so much better than this. What do you think of Katherine’s western ensemble? yes i agree. maybe separate the pieces could work. but the skirt and the belt buckle and the black boots, definitely a huge NO. I actually like the skirt but it doesn't fit in this outfit. big no. giant no. nope. uh uh. my opinion: no bueno...but she appears to be happy wearing this so ... I guess that's what matters?? I'm not a fan of her new hair either. ehhh not sooo bad but her hair is awful! Wow, not feeling that outfit at all! She looks AMAZING from the waist up. That skirt needs a much more streamlined top, and those boots? Well, I just know about those boots. LOL. I love your Fash Fail segments! What was she thinking? None of the pieces go together whatsoever!? visit my blog and read the latest post! i have given your blog an award! Awe, the handbag and boots burned it. It was too over the top. I think they are all great pieces, just not together. oh no no no. just because your husband puts out a country album does not mean you have to translate that into your wardrobe. Together these are just a nightmare. Your right about this one. Unfortunately. But I did love her in Killers with Mr Demi Moore. Not a western type of person but I love the belt. Love the bag. Hate everything else. ah i love her, this style is so pretty! i love this girl and her movies! Cringe. Don't like her matronly hair either. it's like super matronly! why would she do such a thing? Between the overdone western theme and color palette (not to even mention her hair) I can see why she 'Fail's! I was definitely surprised by this look !! What was she thinking? She could totally do better than that. I think it's the combination that doesn't work but each of the pieces here could look great if matched with a different top, bottom etc.